A mother loves her child like no other. So if a mother decides to love her child as much as to decide what is wrong and what is extremely wrong, she knows what she must chose in order to make things right for their child. This movie is just that and does not pretend to come out and cleanse the whole society of its menace. Comparing it to other movies that take the core of the theme and educate the society to fight against injustice would only dilute the substance this one is made of. Ravi Udyawar knows what he is doing with this story and he delivers just that. No path breaking formula, no screaming from rooftops to help remove dirt from the society, no candle marches, no courtroom dramas. A simple story of a mother and a daughter and the lengths at which the mother goes to make her daughter feel safe. Devaki (Sridevi) is a biology school teacher and a doting mother of two daughters. Her eldest, Arya (Sajal Ali), is her step daughter and a relationship of trust is missing between the two, in spite of many attempts made my the mother. Anand (Adnan Siddiqui), the father, makes every possible attempt to bring them closer. But there are bigger challenges that the family needs to face when Arya is gang raped and thrown out of a moving car in a gutter, left there to die. Devki and Anand struggle to find justice in the court of law, when on the basis of Arya’s statement all the perpetrators are caught by the police, led by Inspector Matthew Francis (Akshaye Khanna). When the criminals are acquitted due to lack of evidence, Devki seeks help from a small time Private Investigator DK (Nawazuddin Siddiqui) to bring justice to the them in her own way. 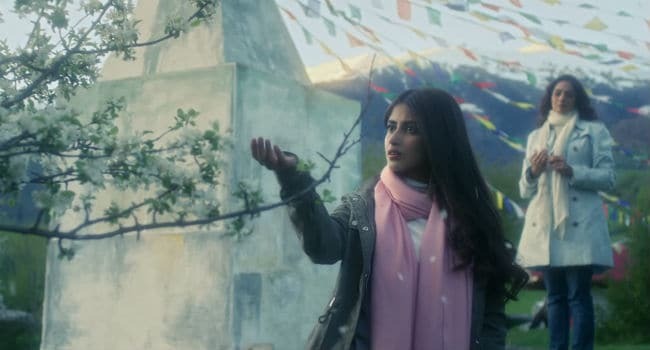 We have seen many revenge dramas and some of them even close to this subject ( We hear Matr, starring Raveena Tandon, is the same premise) but the screenplay here is treated so well that it makes it a riveting watch. Sridevi carries the movie on her frail shoulders bravely. Her performance is measured and her delivery effective. When she is a loving mother, her body oozes love, when she is sad, her eyes draw you in her sorrow and when she is anguished, you weep with her. And that is what makes Devki’s character every mother, because she is all that a mother must. Like when she makes her husband understand that they need not counsel their child but simply understand them, when she says after the ‘accident’ that no one knows what feels, when she breaks down in the hospital after her daughter’s accident. Even though Sridevi takes years to sign a movie, she proves yet again that her histrionics are not to be undermined. She rules the roost in the performance department, today as well. Even though Sridevi carries the movie efficiently, it is Nawazuddin Siddiqui who shines throughout. He has been credited with a special performance and no doubt it was ‘special’ indeed, because we can’t see any other actor pulling off the DK character with such conviction and natural ease. 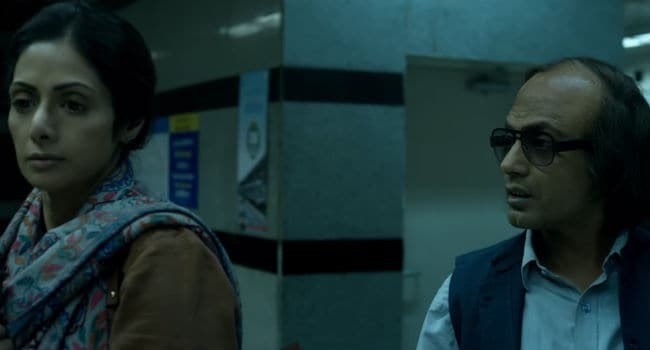 Nawazuddin has not only studied the character but has read through each movement, each nuance of the character which speaks when he delivers the dialogue and which speaks even when he does not. The made-up look of the character could have turned caricaturish but for Nawaz’s robust and sharp articulation, that makes it one of the most memorable of his characters played ever. The performances from other actors is in equal measure to what has been expected of them. Akshaye in his small-ish appearance is underutilised but impressive, and Adnan in Anand’s character is a perfect fit. Abhimanyu Singh only appears towards the end (majorly) but makes his presence felt. What does not work for the movie, possibly, is the predictable climax of the movie but then we don’t see it going any other way. The problem with debut directors who claim a six with strike one is that you tend to raise your expectations from them the next time over. Nevertheless, we hope Ravi Udyawar continues displaying responsibility, sensitivity and bravery in his future ventures as well. An extra special mention to the music composed by A.R.Rahman. Now you may not be reaching out for this movie’s music album ….you know, just to listen. This movie’s music is a character in itself. The emotions created with every beat, every tune, every voice embrace the narrative like they own it and make the viewer transpose alongwith. The background score in the scene post interval when Devki is walking through dyed clothes in shades of red and yellow, fluttering in the breeze, makes you stand up for her and by her side. Applause!! Irshad Kamil’s words shine through like “Kholenge-kholenge bahon ka ghera, Jo chahe kar le andhera, Suraj jaisa khilta chehra”. The lyrics are subtle and untainted just like Devki’s love for her daughter.